So, did you know with a little experimentation you can make virtually any (non neon) color with natural dye? Bright, beautiful pure colours. Textiles (aka, dye) is one of the biggest pollutants in the world. Many companies use low quality dyes, and don't rinse them out properly to make the colours look more intense when you purchase them, explaining why they rinse out for the first several times you wash them, and then look faded by the time a few months have gone by. Properly done natural dyes would be just as long lasting, in most cases longer lasting then cheaply made synthetic dyes, which pollute the earth. In India they use dye rinse water from natural dyes to irrigate crops. i made a dress in my class last semster, and it was see through. So i dyed it with POMEGRANATE! 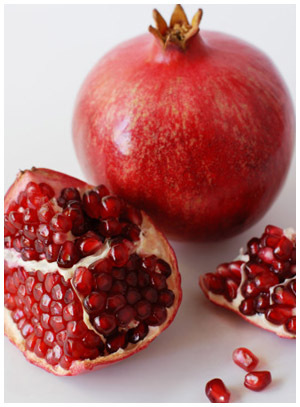 mmmm pomegranate. so tasty. makes such beautiful dye! the recipe i am using involves iron as a mordant. mordants make the colour stick to the fabric. Iron makes pomegranate skins turn a ashy black/brown. Alum, another common mordant, makes the dye a pale green yellow. i used two pomegranates and approx 1/2 a teaspoon of iron powder. apparently you can use a chunk of iron, but i haven't done this before. mmmmmm, ,the tasty bi-product of dying with pomegranite. since you only use the skins, i still get to eat the seeds! hurrah! wrapping the skins in cheesecloth is a good idea so you don't get your fabric goopy. I don't plan ahead... so my fabric got goopy. i ended up having to wash it in the tub. a strangely clean looking picture, showing the skin, and the fabric. the water, iron, pomegranite and fabric need to be boiled to activate the dye. The fabric always looks blacker in the pot, and doesn't lose a lot of value when its rinsed, but turns a more ashy brown. (in reality my stove top, hands, wall and pot are stained grey until i scrubbed them. be careful my friends. i don't have a finished picture, but i have a picture of the fabric when its a bit damp still (and wrinkly!) the longer you leave the fabric in the dye, the darker it will get! this was probably 30 minutes. Edit** i took a picture of it dry and ironed. i also forgot to mention you could get the colour nearly to black if you left it in the pot for several days. New Semester, New Classes, New projects. be prepared to see my first attempts at screenprinting!!!! i am not overly pleased, i may do them again. Polyvore... a website that makes me wish i had more money to shop! i can wishfully think i had these things anyhow, and make fun outfits with them! i've had an account on polyvore for quite some time, over three years. I didn't use it for about two years of that three, and it was interesting when i logged back in to see what i would have worn in the middle of highschool, and how it differs from what i would wear now. on a less silly note, i have just started my new semester! new classes, YAY! well i won't be saying yay by march, but that's life! right now i am taking..... baroque history, craft and design history, developmental drawing for fashion, fashion draping, and screen-printing. you should be seeing some work for the last three over the next while.